The defending EIVA regular season champions will face one of the top defensive teams in the nation last season. 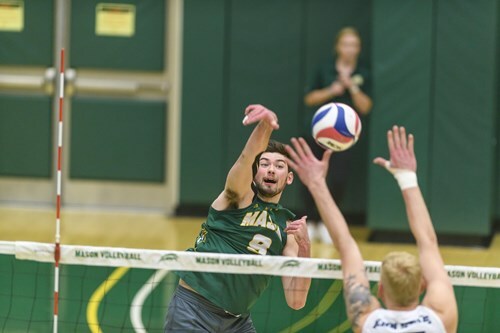 George Mason coach Jay Hosack informed Off the Black that his team will continue its annual non-conference series against Ball State in 2019. This will be the sixth consecutive year that the two teams have met for a non-conference match. The Patriots defeated the Cardinals last season at the Uvaldo Acosta Invitational to snap a four-match series losing streak that dated back to 2014. With the exception of three times since 1983, Ball State and George Mason have played each other in every season. George Mason ended last season winning the program’s first EIVA regular season title during the rally scoring era. In addition, the team set a school record with an 11-match EIVA winning steak but was upset in the EIVA Tournament semifinals. Opposite Hayden Wagner highlights the three All-EIVA selections returning to the Patriots’ starting lineup for the upcoming season. Wagner was second in the EIVA with a 3.48 kills per game average and had at least 20 kills in three matches. Ball State led the nation with a 10.45 digs per game average last year, including 32 digs in its four-game loss to George Mason. The Cardinals rebounded from that non-conference loss to finish in third place in the MIVA and reach conference tournament semifinals for the second straight year. Setter Romano also returns for his second season in the Ball State starting lineup after earning All-MIVA honors in 2018. The Ball State match on Feb. 10 will concluded a weekend of back-to-back non-conference matches against MIVA opponents. George Mason also will play Purdue Fort Wayne on Feb. 9.